Amsterdam is a beautiful city. It doesn’t take long to appreciated that. The water glistens off the canals and contrasts with the elegance of the brick facades creating a unique view and experience. There are however, bits of information that can be learned about the city and the architecture that can make it that much more interesting for the traveler. 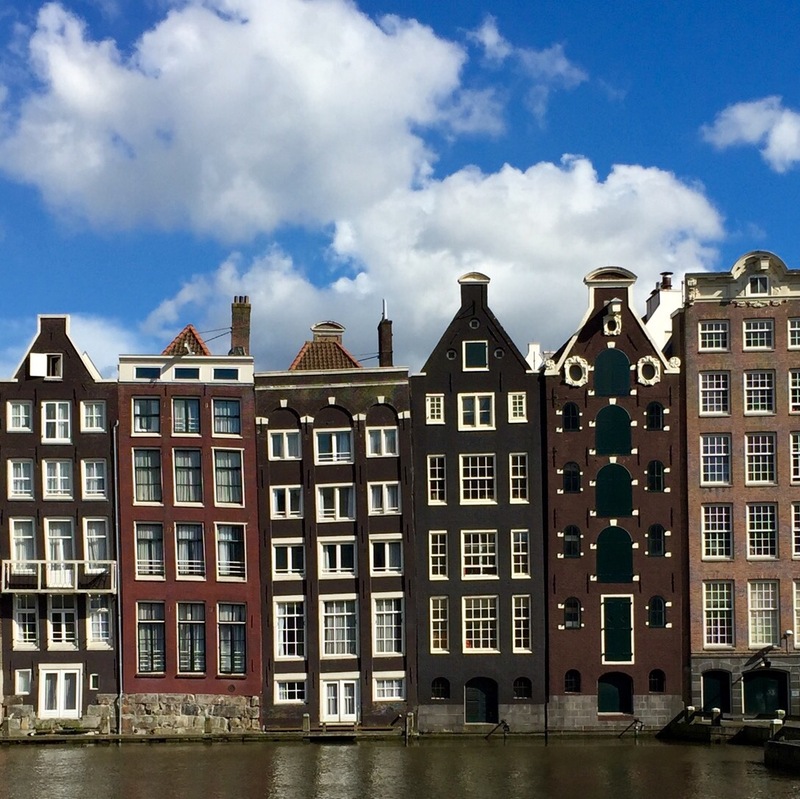 The last time I visited Amsterdam, I noticed, as many tourists do, that many of the canal houses are tilted. This, one might assume, is due to age. Many of the buildings in the canal building date back to the 16th century. So naturally, over time, the buildings settled and will being to lean, as in the image above. However, many other buildings tilt in a different way. Visitors may also notice that many of the canal houses have hooks coming from their rooftops. These hooks are used to move furniture and other belongings into apartments when new owners take up residence. Staircases and hallways are often too narrow to fit large pieces. When the hooks are used to move large and bulky items though, there is the chance that they could hit and damage the building. Thus, the buildings are tilted forward so that when the hooks are used the furniture doesn’t bump the building. You can see the slight tilt in the following photo. Courtyards The casual visitor to Amsterdam often does not get a chance to peer beyond that steps of the canal houses. Most of the were at one point the homes of the city’s wealthiest families. They built their homes in positions of prominence, and as large as possible. The standard size of a canal house was seven meters wide. If one could afford to build a house twice that six, it was a definite indication of wealth and success. There was, however, a city ordinance that required a certain amount of “green space” as we might call it today, be set aside in the building process. Instead of creating a mere park-like atmosphere, the occupant would often install various statues. But, not just any statues. Colossal statues. Larger than life sculptures to create more of an amusement park type atmosphere. You can see one of the remaining sculptures at the Amsterdam Museum. In the early years of Amsterdam’s growth it was common for the residents to identify their profession with a tile above or near the entry way. Similar to these – a wheelbarrow and a boat. Prior to the Protestant Reformation, there had been many home with gable tiles depicting saints. However, as the Reformation and wars of Religion were underway, it became dangerous for some families to display their Catholic allegiance, so they were taken down. Some have been preserved within the walls of the Begijnhof. While it might seem ideal today to have big windows in your house overlooking the canal, these large openings were originally a necessity, not a luxury. They were installed to facilitate moving goods and cargo in and out. These old warehouses are a reminder that Amsterdam has not always been the quaint, charming city we know it today. It was a working city, and in some areas, an industrial city. This wasn’t really a surprise. I am not one of those people who dreams of time travel for the quaintness of other historical periods. The amount of relative difficulty and filth in other times have me pretty secure in the idea that our modern times are best for us. That was solidified at the Amsterdam Maritime Museum. There one can tour the East India Company ship from 1700s. It regularly made trips to the East Indies to bring back spices and other goods. One can freely board the ship and have a look around. The quarters are cramped. Unless, of course, you’re the captain! I don’t really think I learned how to pronounce this word, but when they look like this, it hardly matters. They taste delicious!